I’m sure most of you have seen or heard about the object that washed up on the beach last week. Since nobody knows for certain what it is, some media outlets are now using terms like “space junk” and “mystery object.” The story was featured on local, national and international outlets, including Yahoo News, Drudge Report, CNET and the Daily Mail (UK). Since then, Town Hall has continued to receive calls from local and national news outlets seeking more information. SIPOA Security received a call about a large object on North Beach last Thursday morning. SIPOA notified Town Hall about the object by email around 9:30 am Thursday. Both SIPOA Security and the Town contacted the U.S. Coast Guard in Charleston. The Coast Guard responded that the object was not from one of their buoys, and they weren’t quite sure what it was. They did not express any concern about the object, and did not offer any assistance with its removal. As you can imagine, a lot of people were coming up and asking questions and taking pictures of the object. For safety purposes, SIPOA Security stayed with the object until it was removed from the beach. Town staff arrived on North Beach at approximately 10:15 am. After discussing options for its removal, we contacted Tom Strehle from the town’s landscaping contractor, Sunburst Landscaping, as well as staff from SIPOA Maintenance for assistance. An SIPOA Maintenance truck was able to bring a flatbed trailer onto the beach shortly after 11:00 am. The object itself had a hollow center which was surrounded by dozens of layers of foam panels. It was water logged, but otherwise not too heavy. Four people were able to roll it onto the trailer and tie it down. SIPOA Maintenance hauled the object off the beach at approximately 11:30 am. It was taken to the SIPOA Maintenance Facility for disposal. The first images were reportedly posted on social media by the Lowcountry Marine Mammal Network. This was the original source for most news outlets. While it hasn’t received the same level of attention, a second object washed up on the beach in Kiawah Island. 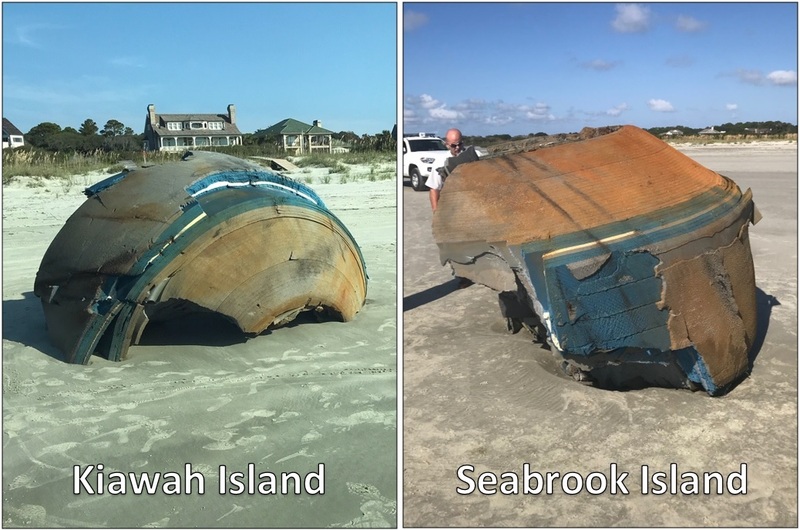 Comparing photos of both objects, it appears that the one in Kiawah was the other half of the same object that landed in Seabrook Island. No one knows for certain the origin of the objects that washed up on Seabrook and Kiawah Islands; however, our best guess is that they came from a buoy or some other type of marine flotation device. At this time, we have no reason to believe that they are “space junk,” an “alien aircraft,” part of a “jet engine,” or anything else that has been hypothesized so far. There was nothing radioactive, and certainly no little green men escaping from the scene. If you think you know what it may be, feel free to email us at www.townofseabrookisland.org, or comment on our Facebook page at www.facebook.com/townofseabrookisland. This entry was posted in In the News, Town of SBI. Bookmark the permalink.